178 pages | 52 B/W Illus. Researchers are expected to produce original findings, yet nobody explains how original contributions are conceived in economics. Recently there have been calls for more creativity in economic research, yet there is no literature that explores creative research apart from collections of biographical essays. This book aims to address that gap, exploring the process of conceiving and generating ideas for interesting and original research contributions in economics (and potentially other social sciences too). 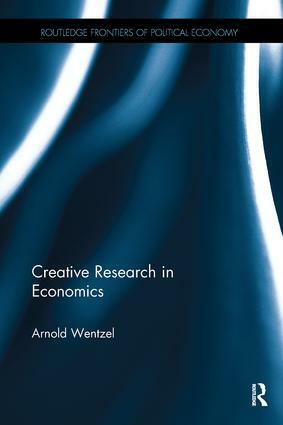 Creative Research in Economics serves both a practical and theoretical purpose. Theoretically it presents a unique way of thinking about the nature of problems and questions in economics and the role of social science researchers in society. As such it offers an interesting way to think about the philosophy of science and methodology in economics, and how new ideas emerge in the discipline. Practically it develops techniques for finding interesting and original research contributions (as opposed to conventional data-gathering research). Whether you are a graduate student looking for that first interesting question, a novice researcher in search of fresh avenues for research after your PhD, or a seasoned academic looking to teach the philosophy and methodology of economics in more interesting ways, you will find this book of great use. Can creative research be a systematic process? What will be regarded as conceptions? Arnold Wentzel is a lecturer at the University of Johannesburg, South Africa, where he teaches economics, education and research writing across a range of disciplines.